We’ve just come back from a 2 week holiday to China covering Shanghai, Xitang, Xian and Beijing. Scroll down to find out how we got on catering for an Ovo-Lacto Vegetarian diet in China. Spoiler – it might be easier than you think! 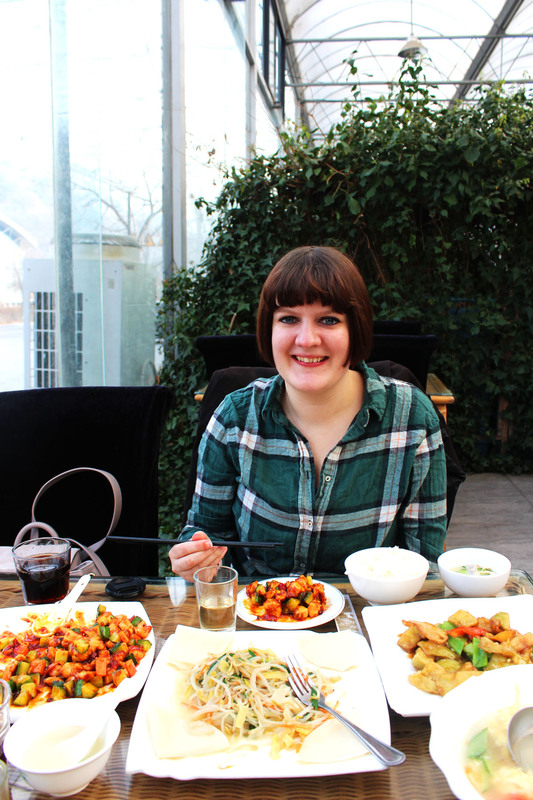 Before we set off for our two week holiday in China we asked friends and family who had lived or visited there for advice on finding vegetarian food in China. Jon’s been a vegetarian as long as I’ve known him so I’m used to having to do my research before jetting off on holiday, but it seems the further away we travel, the less likely that vegetarian food is going to be easy to find. We were a little apprehensive as most people we spoke to said that vegetarian food would be hard to come by. After all, there’s a tongue in cheek Chinese saying that they eat anything that swims, flies or has four legs and pork seems to be in everything. That being said they are an agricultural country and fresh fruits and veggies are in abundance. So, if you follow the tips and tricks in this post you shouldn’t have any problem eating a plant based diet while on your travels. 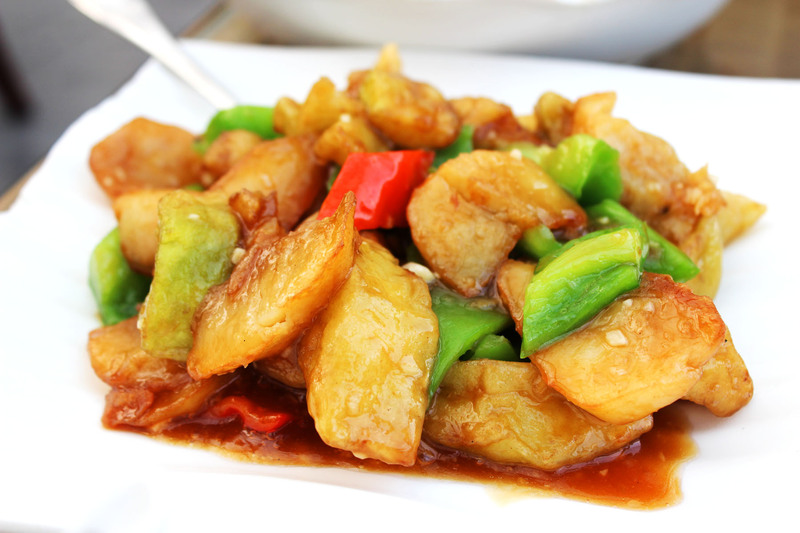 By the end of your holiday you’ll have stuffed yourself silly with authentic vegetarian Chinese food! I’ve been so inspired by the food we’ve eaten on holiday (including the vegetarian food) that I’m going to be replicating some of the dishes here, so do come back soon to see some of the recipes! The trickiest thing about a trip to China is the language (unless of course you happen to be fluent in Mandarin.) I’ve taken lessons in the past but despite my best efforts the locals sometimes struggled to understand my accent. That being said, we learnt a few key phrases which I’ve set out below to help you on your hunt for vegetarian food in China. Before you start trying to memorise the phrases I recommend trying this website for tips on pronunciation and tones. It might also be useful to write these phrases down in simplified Chinese, or invest in a good phrasebook! We also found it useful to know the word for eggs (‘jīdàn‘). We often had to explain that although Jon didn’t eat meat he did eat eggs. Surprisingly I think it might be easier to a vegan in China than a vegetarian! Contrary to popular belief it is possible to find vegetarian food in China – in fact if you tell restaurant staff you have a Buddhist diet you will have plenty of tasty vegetarian dishes to choose from! This is one of the easiest ways to make sure you don’t leave a restaurant hungry. Most Buddhist restaurants are located inside, or just a short walk away from, temples. The lotus flower is a good indication that the restaurant may be Buddhist. A Chinese Buddhist’s diet is vegetarian (sometimes even vegan) and is based on the Dharmic concept of ‘ahimsa‘ which means ‘non-violence’. This means you can be sure that when eating food fit for a Buddhist there will be absolutely no trace of fish or meat in your dinner. Some Buddhists extend the principle of non-violence to plants so harvesting anything that would result in the death of the plant such as root vegetables are also prohibited. But…with a Buddhist diet there are a few ingredients you might not notice are missing until you taste the food. Wǔ hūn (五荤, or the ‘Five Acrid and Strong-smelling Vegetables’) and wǔ xīn (五辛 or the ‘Five Spices’) are missing from Buddhist food as they “excite the senses”. These include garlic, onion, ginger and even coriander ! Those of us who cook Chinese food at home will recognise these as the cornerstones of most authentic recipes. If you think you might miss these flavours then perhaps relying on the Buddhist diet for the entirety of your holiday isn’t ideal. 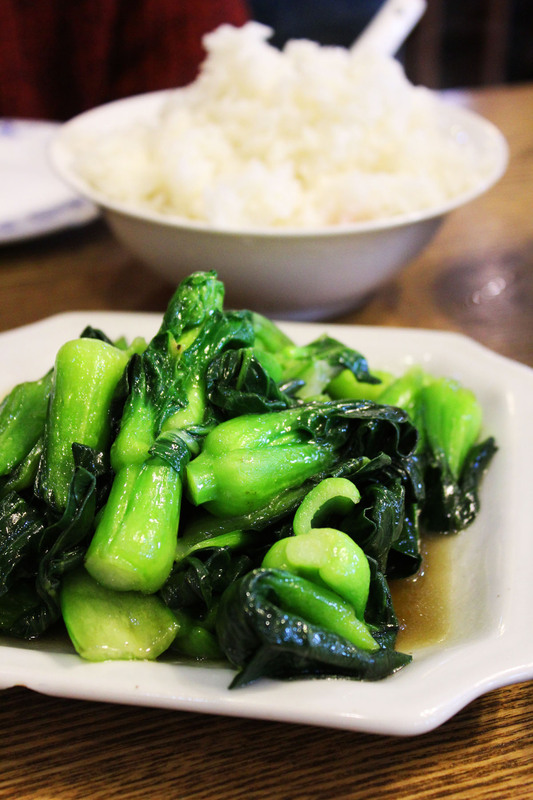 Whilst visiting a Buddhist restaurant once or twice is a must for any vegetarian in China, there are plenty of other ways to find vegetarian friendly authentic Chinese cuisine – so keep reading! 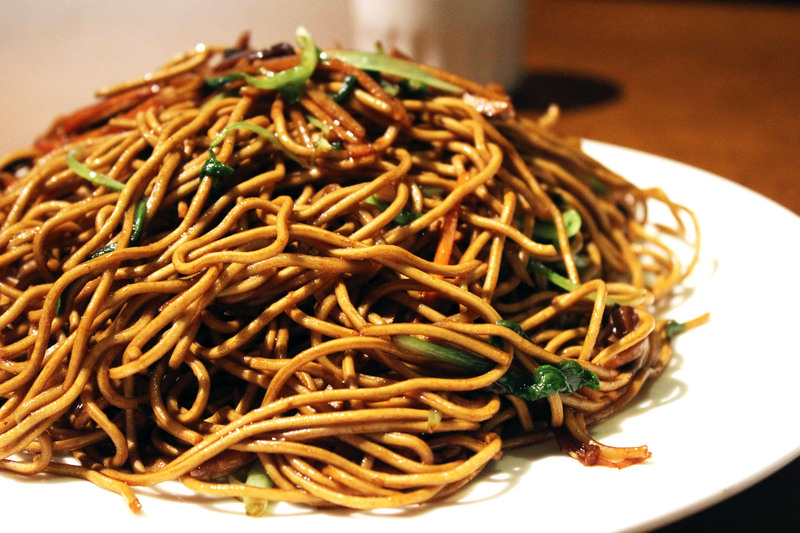 One of the simplest ways of eating vegetarian in China is to simply pick the foods that are by their very nature vegetarian. That sounds obvious right? But I think a lot of people overlook the fact that some of the simple snacks served at street food stalls across the country are meat free. Keep an eye out for these delicious street foods and you won’t have to have a complicated conversation with a local about your dietary restrictions and you can stuff yourself silly! These deep friend dough sticks look very similar to churros but don’t be fooled – they are savoury and a little salty! They are often eaten for breakfast and dipped in soy milk or a rice/bean porridge. These “pancakes” are actually a round crusty flat bread made with spring onions and served either sweet or salty. Perfect for lining your stomach before a night out or filling yourself up during a long day of sight seeing! Steamed buns do sometimes come stuffed with meat but you’ll have no problem finding varieties stuffed with vegetables or (my favourite) red bean paste! 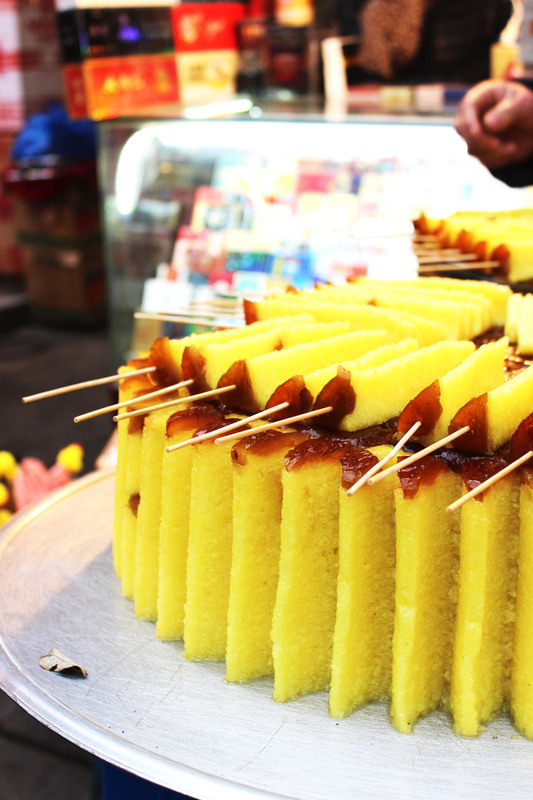 Popular in northern China, these are made much like crepes anywhere else in the world. First they spread the batter on the heated flat iron plate, add an egg and some fresh vegetables (and meat if you ask), then they will flip it over before brushing on your choice of savoury sauce, finally they roll it up and serve. 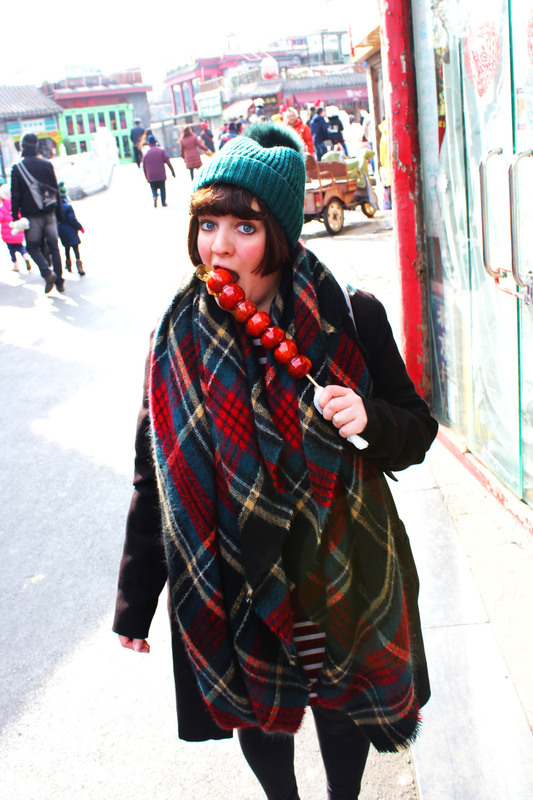 In China they love eating things on sticks – you will see these street food vendors everywhere. Often it’s meat, squid or even crab on offer but you can also get sweetcorn and spiralled potatoes which are perfect for veggies! The corn will be barbecued on a long grill with heated charcoal: the potatoes however will often be fried. A sauce will be brushed or drizzled on and a mix of spices and herbs is then sprinkled over. Stinky tofu really is an acquired taste but a must try for anyone visiting China. The street food vendor will fry the tofu in small wok with plenty of hot oil. It’s then served in a paper bowl with a spicy and salty brown sauce, topped with chopped green onion and parsley. Sugar coated haws/hawthorns are a Beijing speciality but you will now find these across China. The apple like fruits (or haws) are skewered on a stick and dipped in sugary syrup not dissimilar to toffee apples we know and love. Each bit is sour and sweet! Nowadays you can find all sorts of sugar covered fruits on sticks. Expect to pay more if you want strawberries. I’m well aware that people become vegetarian for a whole host of different reasons so some vegetarians won’t be interested in trying dishes that include mock meat. But those of you who don’t mind mock meat are in for a treat. The art of making vegetarian food that looks like meat actually goes back hundreds of years in Chinese history. Wheat gluten, called miàn jīn (面筋, or “dough tendon”) is thought to have originated in ancient as a meat substitute for Buddhists and possibly even Chinese emperors who would eat a vegetarian diet at certain times of the year. I’m no food scientist but from what I understand, mock meat is made by ‘washing’ wheat flour until all the starch granules have been removed, leaving behind sticky insoluble gluten which is a stretchy and very sticky. It is then shaped and processed before being fried, steamed, or baked to replicate different meat or fish like textures. As a meat eater who holidays with a veggie, I was VERY impressed with the realistic look and texture of some of the mock meat dishes we ate. Whilst Jon enjoyed being able to have more to choose from at mock meat restaurants there were a couple of times he wavered over the food being a little too realistic. By the end of the fortnight he had tried everything from fake fish, to chicken and even lamb kebabs! Some of the menus we saw even had mock Peking duck and roast goose! If you are keen to find a mock meat restaurant while you’re in China, then check out our favourite vegetarian restaurant website ‘Happy Cow’ below. My final tip is quite simply do your research! 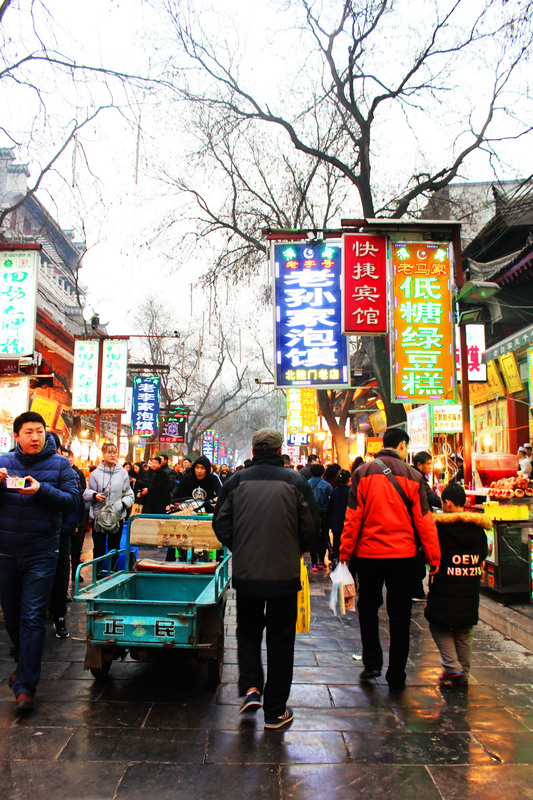 It is a little trickier finding vegetarian food in China so the best thing you can do is have a list of restaurants you know offer mock meat, a Buddhist diet, or just a good list of vegetarian friendly restaurants. Happy Cow is now our go-to website when trying to find veggie restaurants on holiday. Simply type in the city or town you are visiting and it will list a whole host of vegetarian and vegan restaurants near you as well as those restaurants that aren’t exclusively veggie but have a good vegetarian selection, and also health food stores. The website is particularly handy as it offers the addresses of the restaurants in simplified Chinese which you can show to your taxi driver! Looking for tried and tested restaurant menus? Listed below are two restaurants we highly recommend for vegetarians visiting either Shanghai or Beijing. 258 Fengxian Road (at Nanhui corner, off Nanjing Rd West), Shanghai, China. Vegetarian Lifestyle was the first meal we had in China and Jon’s favourite. The menu is in English as well as Chinese and offers pictures so you know what to expect. The staff speak a little English but learning please, thank you, I want this and asking for the bill is handy. We ate all sorts but highly recommend the kung po “chicken” (a mock meat dish) and the tea smoked mushrooms. Ok, so it’s not a Chinese restaurant but Xian is famous for being located at the end of the Silk Road and has strong connections with the middle east and India. This Indian restaurant offers some meat dishes but over half of the extensive menu is vegetarian and vegan. The owner is a vegetarian himself so well placed to understand any dietary restrictions you might have. The staff also speak English reasonably well so you shouldn’t have any issues explaining yourself. We particularly recommend the vegetarian korma which includes an interesting combination of vegetables, nuts and dried fruits. 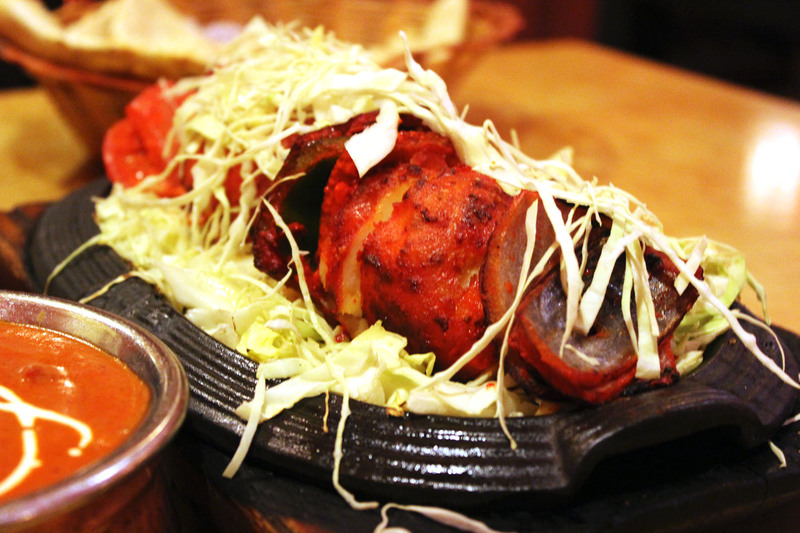 The tandoori potatoes stuffed with paneer are also a must have! The Asian inspired Indian dishes are delicious. This family run restaurant is a little hard to find as it’s tucked away in a hutong. Just a few steps down the alley, you’ll find the entrance. Step in to a health food store before going through a courtyard to your left. You’ll then find the entrance to the restaurant in an old house. The staff don’t speak much English which can be tricky but the menu is on an ipad with some translation and pictures which helps. Again the menu includes a mix of vegan and vegetarian dishes as well as some mock meat. As everything is vegetarian friendly you don’t have to worry about your dietary restrictions being met despite the language barrier. 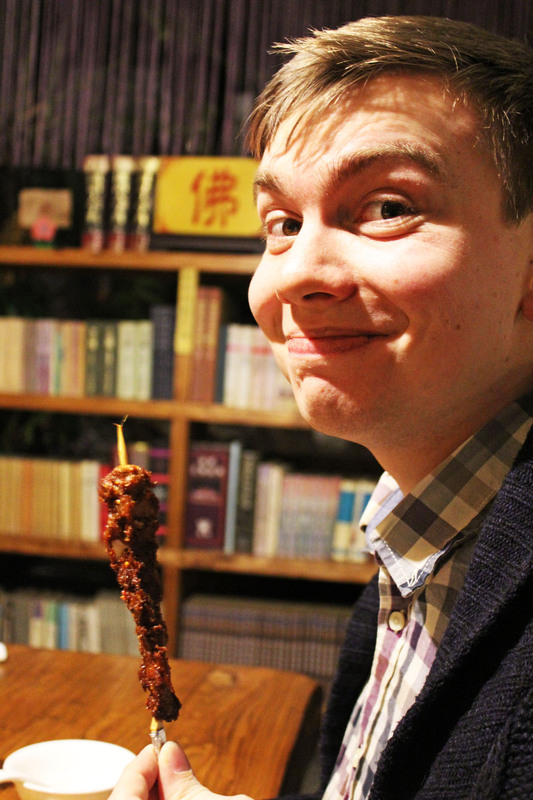 We’d definitely recommend the dumplings and the mock “lamb” kebabs! 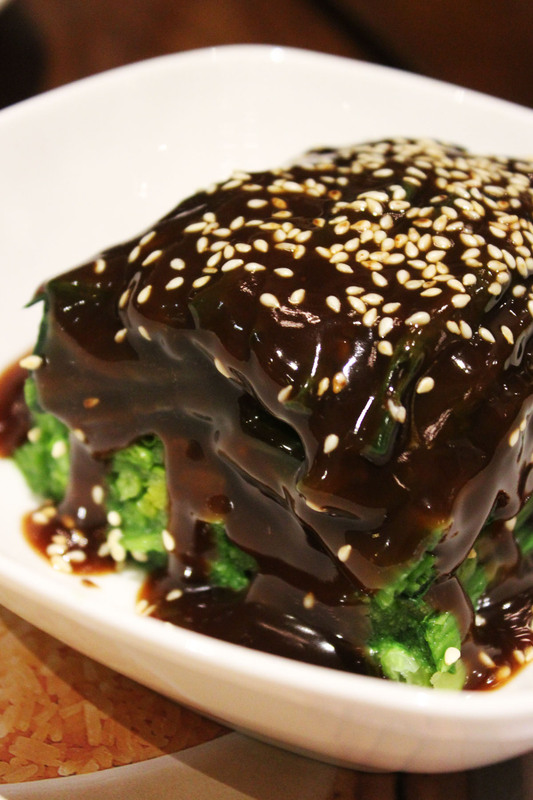 All branches of Duck de chine also offer a lot of vegetarian dishes on an otherwise meaty menu, as does Orient Kitchen in Sanlitun. This is a BRILLIANT post, thank you so much! Travelling as a vegan or vegetarian is usually much easier than we expect but it is fabulous to be able to go so well informed! Thanks Chris. You’re right it often is easier than you think. With a few good bits of knowledge under your sleeve you’ll have tasty veggie food in no time. I remember being told we’d have a nightmare in Prague, then discovering there was an AMAZING chain of veggie restaurants across the City! Looks like you went prepared and then did really well at finding delicious vegetarian food! I think taking the note about being vegetarian written out in the local language is a really good tip! That’s probably my top tip for China in general. Having the address of where you wanted to go in Chinese characters was also handy for taxis! I love this post, really useful and informative. You’re right, people do assume that there isn’t much for vegetarians in china but you’ve proved them wrong! I’d love to go there, all looks yummy!